Citation: C N Trueman "The Battle of Gazala"
The Battle of Gazala was fought in North Africa in 1942 and culminated with the Allies losing Tobruk – a defeat Winston Churchill called a “disgrace”. The Battle of Gazala came after there had been a lull in the war in North Africa from February to mid-May 1942. Erwin Rommel was keen to continue his campaign in the region while Churchill wanted his military commanders there to show a more offensive approach. The loss of Tobruk was a huge blow to the morale of the Allies and seemed to typify the different strategies shown in North Africa – Rommel’s willingness to go on the offensive and improvise his plans, compared to the conservative strategy adopted by Lieutenant-General Ritchie, commander of the 8th Army. Rommel’s attack on Gazala came at an interesting time during the war. To all intents the Axis forces were doing well in mid-1942. Most of Europe was under Axis control, the Germans seemed to have recovered from their failure to capture Moscow and were developing their forces for a massive attack on Stalingrad. In the Far East, British and Indian forces were in retreat in Burma while the Japanese were consolidating their power in the huge region they had conquered.The war in the desert had been ongoing since June 1940 with neither side able to deliver a knockout blow. The terrain made a cohesive strategy nearly impossible as a victory was difficult to follow up. The sheer distance between each side’s headquarters in North Africa – 1,300 miles – gives some indication that communication was also a major issue. A campaign in the desert tended to go in fits and starts. The Afrika Korps was a poor cousin to the forces being readied for Operation Barbarossa in terms of the equipment they were given. Rommel had a constant battle getting OKW to supply him with enough fuel and modern equipment despite his apparent success there. In late-January 1942, Rommel had re-captured western Cyrenaica and had advanced his two divisions to within 26 miles of Gazala and 64 miles from Tobruk. The came a lull in fighting during which both sides reorganised their men and equipment. Little took place between late January and late May. The success of the Axis forces may well have led their leaders to become overconfident. OKW believed that Rommel had the necessary forces to take Egypt and the Suez Canal. The value of the capture of such a target for the Germans was massive. The lull between January and May allowed for both forces to regroup.Churchill became a major critic of General Auchinleck (Commander-in-Chief of the Middle East) for his failure to be more aggressive. Churchill had his reasons for taking this stand. The Allies were not doing well against the Axis forces – and he needed a victory or at least signs of an aggressive campaign – to bolster Allied morale. There was also a real fear that Malta would be invaded. Malta was a serious problem for the Germans. Their air force and U-boats were dominant in the western Mediterranean but the RAF bases in Malta and the naval force stationed there did a great amount of damage to the Germans attempt to supply the Afrika Korps in North Africa. Malta took a pounding from the air and was awarded the George Cross by George VI for the heroism shown by the whole population. However, by late Spring 1942, there was a real fear that the island would be invaded and that the Germans would have a near free-hand with regards to supplying the Afrika Korps. Hence why Churchill wanted Auchinleck to be more aggressive with regards to his strategy. In particular, Churchill wanted Cyrenaica retaken as planes from the RAF could use the air bases there to attack Axis shipping if Malta did fall. Auchinleck did not share Churchill’s viewpoint – and many senior commanders in North Africa agreed with the ‘Auk’. If any Allied attack was to take place, Auchinleck believed that it should be well planned and the force involved well equipped for the attack. Such an attack would need time to prepare. This attitude put him on a collision course with Churchill who sent him a ‘comply or resign’ telegram. Auchinleck promised an offensive in June. Ironically, Rommel faced a different problem. His superiors wanted him to be more cautious in his approach. OKW’s mind was no doubt on Barbarossa but on May 1st they did give Rommel permission to attack Tobruk when they realised that success here would greatly help ‘Operation Hercules’ – the planned invasion of Malta. By the middle of May both sides were planning an offensive campaign – the British to recapture Cyrenaica and the Germans to capture Tobruk. British forces in the region known as the Gazala Line numbered 100,000men. The 8th Army was led byLieutenant-General Ritchie and was made up of the 13th Corps, led by Lt-General Gott, and the 30th Corps led by Lt-General Norrie. The 8th Army was served by 849 tanks, made up of Grants, Stuarts, Crusaders, Valentines and Matildas. Of 320 planes in the region, only 190 were in service. British forces in Gazala and Tobruk were protected by the Gazala Line – a massive defensive barrier that consisted of huge minefields (one extended for 43 miles inland from the coast) and a series of inland ‘keeps’ which housed a complete brigade. ‘Keeps’ or ‘boxes’ were designed to house a large number of men and equipment – the most important were at Bir Hakeim, which housed the Free French, and at Knightsbridge, which housed the 150th Brigade of the 50th (Northumberland) Division. On paper, the Gazala Line was a formidable defensive barrier. However, it had serious weaknesses. British planners assumed that Rommel would attack along the coast road. Therefore a disproportionate amount of men and equipment was held in the coastal region, at the expense of inland positions. The ‘keeps’ in particular had less artillery ammunition than they wanted. When some was ‘acquired’ from Tobruk for the ‘keeps’, senior officers ordered its immediate return to Tobruk. Rommel’s intelligence suggested quite clearly that the British strength in the south of the Gazala Line was not as strong as the British wanted to portray. Rommel’s forces numbered 90,000 men. He had access to 560 tanks of which 332 were German and 228 were Italian. He also had available 497 serviceable planes. Rommel attacked on May 26th 1942. He sent a decoy attack along the coastal route while he planned to send the majority of his force, his famed Panzer units, in a sweeping arc south and attack the Gazala Line primarily from the south and drive north to Tobruk. So confident was Rommel of success, that he only gave his armoured units food, water and fuel for four days – as he assumed that the battle would be over by the end of May 30th. Rommel’s initial success nearly overwhelmed the British forces behind the Gazala Line. However, the Afrika Korps’ success had one major problem – Rommel’s armoured columns were so successful that they moved too far from their supply lines – primarily fuel. Whereas the British forces were in close proximity to their supplies. The superior armour that Rommel had access to (in terms of quality) could not work without fuel. The British M3 General Grant tank was well suited to the desert but inferior to the Panzer Mark III’s and VI’s, especially the III and VI Specials. However, in the second phase of the battle, these tanks had fuel supply problems whereas this was less of a problem for the Grants. By May 28th, Rommel’s success was almost his downfall. His armoured units had moved too far from his fuel supplies. British Intelligence had also concluded that Rommel only had 250 tanks at his disposal to Ritchie’s 330 – quite a disparity. On the night of May 28th, Rommel himself searched for his supply convoy. After he found it, he personally guided it to where his Panzer divisions were. Critics of Ritchie claim that if he had been more aggressive in his strategy he could have taken great advantage of Rommel’s precarious position. However, by the 29th, the time had passed. 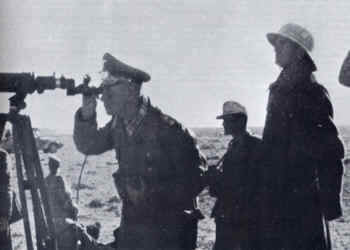 Rommel was, by this time, in a better position in terms of supplies but he was not in a position to do what he wanted to do – attack and take Tobruk. Therefore, after a series of inconclusive battles on the 29th, Rommel decided to go on the defensive. He placed his armoured divisions within a formidable defensive barrier surrounded by feared 88-artillery. However, he had placed his forces near a huge British minefield and near the 150th Brigade Box – one of the heavily armed ‘keeps’ placed away from the coast that gave Ritchie a major military presence inland. By any standards, Rommel’s tactics were unconventional. The area in which he had placed his troops and vehicles was to be called the ‘cauldron’ for very good reasons. German sappers worked tirelessly from May 29th to the 30th to clear a path through the minefield. Their success meant that Rommel could at least have a clear line with the Italians forces supporting him. The 8th Army did not exploit this vulnerability and only launched a major attack on Rommel on June 3rd, thus allowing the ‘Desert Fox’ to reorganise his forces. It was this perceived hesitancy by Ritchie that was to induce the anger of Winston Churchill. Why was the attack on the 150th so important? Victory meant that Rommel had secure supply lines for the first time in months. Fully equipped, he could select when to attack the 8th Army. Auchinleck advised Ritchie to launch an attack on Rommel’s position with due speed after June 1st if only to let the Afrika Korps know that the 8th Army was still a formidable fighting force. Auchinleck was also concerned that no action would allow Rommel too much time to consolidate his position. Severe desert sand storms meant that the 8th Army could do little on June 1st and 2nd. However, patrols sent out to hinder the Afrika Korps were successful. Sergeant Q. Smythe of the 1st South African Division won the Victoria Cross for action against the Germans in one such patrol. A major attack by the 8th Army against Rommel started on June 5th – ‘Operation Aberdeen’. Unfortunately it was poorly managed and coordinated and led to large scale losses in the 8th Army – 6,000 killed or wounded, 150 tanks lost and 4,000 POW’s. Tank units felt the full force of expertly placed German 88’s and without proper armoured cover, the infantry units that followed on suffered accordingly. Ritchie ordered that a defensive perimeter was to be put around Tobruk which extended out to 30 kms from the city. ‘Fortress Tobruk’ was placed under the command of Major-General H Klopper, commander of the 2nd South African Division. Klopper had at his disposal about 35,000 men and a total of 2,000 military vehicles of various types. Supplies of all sorts were designed to last for 3 months. However, Klopper also faced a number of serious problems. The Desert Air Force had moved to bases that were too far away from Tobruk to give it any form of air cover when the attack was to come from Rommel. Secondly, he had no modern anti-tank weapons at his disposal as he was primarily equipped with about 40 outclassed 2-pounders against Rommel’s tank force. His third serious problem was that there were very large gaps in the mine fields that surrounded Tobruk. At 08.00 on June 20th, Rommel attacked Tobruk. By 10.00, the Afrika Korps had penetrated nearly 3 kms into the 30 kms perimeter put around Tobruk. Defensive positions crumpled and by 19.00 the XXI Panzers were actually in Tobruk. The capture of Tobruk had taken less than one day. Klopper formally surrendered to Rommel on the morning of June 21st and all fighting had ended by the end of that day. Why did ‘Fortress Tobruk’ fall so quickly? The initial air onslaught followed by a massive mechanised attack did a great deal of damage in a very short space of time. News of the Afrika Korp’s success led to Klopper ordering the destruction of all his signaling equipment in his headquarters. Without this equipment, Klopper could not communicate with his subordinates. The breakdown in the chain of command was an undoubted assist to Rommel’s victory. What did Rommel achieve? The capture of such a major North African base was a great psychological blow to the Allies. Rommel captured 2,000 tons of petrol, 5,000 tons of supplies and 2,000 serviceable military vehicles. he also had to take care of 33,000 POW’s. According to German records, the Afrika Korps lost 3,360 men but 300 of these were officers (70% of the officers who fought in the attack on Tobruk). Rommel himself was made a Field-Marshal by a delighted Hitler. Ironically, the defeat did have some positives. It was to propel into the limelight Bernard Montgomery. The defeat also led to Roosevelt sending 250 new Sherman tanks to help out in the desert war.